In looking at the pros and cons of housing lifestyles, what type of house should I buy? Some people work long hours most days of the week while others work involves a number of days on and then a number of days off. Fire fighers and law enforcement are prime examples of the latter group. Some folks are exceptionally handy and can fix anything while others would be uncomfortable using a hammer. The pros and cons of housing are sometimes overlooked. People sometimes begin the home buying process without thinking about or reviewing their preferences or circumstances. If they have lived in a particular type of home all their life, other options are not “top of mind” at an important time in their life. Other times, family members have a preference, but it is in conflict with their partner. Some of us ask family and friends, or they just weigh in with an opinion. There are many situations that can affect the ultimate decision. Some people work long hours most days of the week while others work involves a number of days on and then a number of days off. Firefighters, emergency room personnel, and law enforcement officers are prime examples of the latter group. By combining a number of days off with a person who is handy and can fix anything could suggest a duplex or apartment building in their future. By reviewing your options now, you may avoid wasting valuable time when someone introduces you to a lifestyle you like better down the line a month or two. Worse yet, you could discover after you have moved you bought a lifestyle with which you were not satisfied. People will sometimes set up their goals based on buying a home in a certain neighborhood or price range. As an example, the neighborhood they like will require about a two-hundred fifty thousand dollars starter home. Their plan is to save more money over the next 3 to 4 years to make a good down payment to keep their housing costs around thirty percent of income in that neighborhood. They never considering buying a home now in a moderate neighborhood with a low down payment that is about the same size and costs as the apartment they are living in today. It may be possible to set their sights lower now, and by doing so, they will get to their ultimate goal sooner. Providing information on the lifestyle options available before you begin your search helps you determine which lifestyle interests you the most. For some, these comparisons may provide a new direction to pursue in your search for the perfect lifestyle. If you are not certain which direction to follow, that may be a reason to look at different types of property, or talk with people who have made different choices to gain additional perspectives. 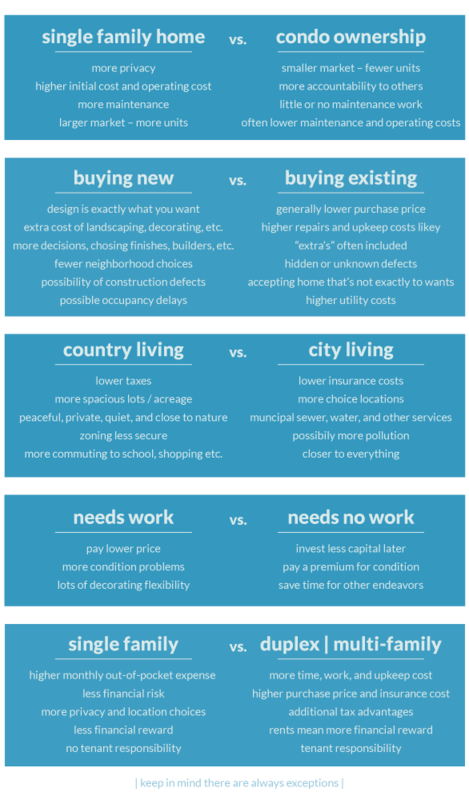 What types of housing fit your lifestyle? The comments described here were made by a large number of people over many years. It is not an all inclusive list. The comments on the chart will not always fit in particular situations. This page is meant to help you weigh the pros and cons on the obvious characteristics of each option and to encourage an awareness of the choices. This exercise allows you to make your home lifestyle decision with confidence. You are preparing to make a significant investment and the more you know about your real estate choices, the better.